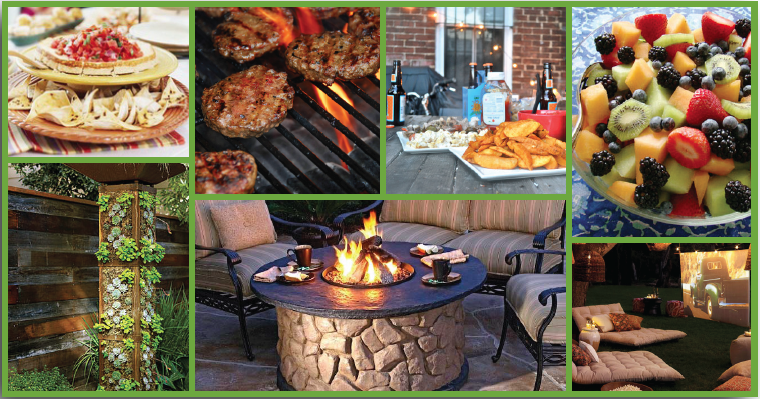 Summer took a while to arrive this year, but now that it’s here, be sure to enjoy the warm weather out in your yard! Now is the time to invite over some friends and/or family and throw that summer bash you’ve been meaning to. Not sure if your yard is up for a get together, though? Here are a few inspiring ideas to get you and your outdoor space ready. Big or small, your yard should be a cozy environment. Outdoor fireplaces or fire pits are great ways to add this touch and are perfect for cool summer nights while making s’mores! If you have a large yard, think about creating smaller “rooms” to organize the space with functionality while creating that cozy feeling. Landscaping appropriately doesn’t have to be extravagant or accomplished by big projects either. Get creative and use/reuse/revamp what you have. If you don’t have very much space to work with, think of pieces that have multiple uses. Find ways to marry form and function. Take some of the ideas in this issue for organizing small spaces and apply them outdoors as well. Keep in mind, less is more. Decorating is in the details but don’t clutter smaller spaces with tons of small objects. Think outside the box. Always wanted a great garden? What about a vertical garden! Want to make use of all your outdoor spaces? Don’t forget about that side yard! What about after summer? Plant for all 4 seasons with spring forsythias, summer hydrangeas, early fall Japanese anemones that turn in late November, and a few evergreens to maintain some color all winter. 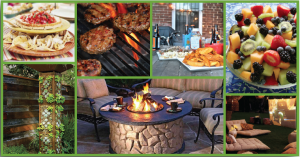 With a little creative thinking, your yard can become the perfect place for entertaining. Now that the scene is set, it’s time to add the people and the food. Fire up the grill while the kids play in the yard. It’s summer… show some color with lots of fruits and if you’re limited on table space, layer it up with tiered appetizer platters. A wire caddy can be a fun way to keep condiments organized and try smaller metal buckets filled with ice instead of a bulky cooler. This will keep drinks around the party for easy refills that are perfectly in reach. Add some fun games and enjoy the sunshine. We’ve waited for it long enough!